What’s in a name? A lot. At least when it comes to a cafe. 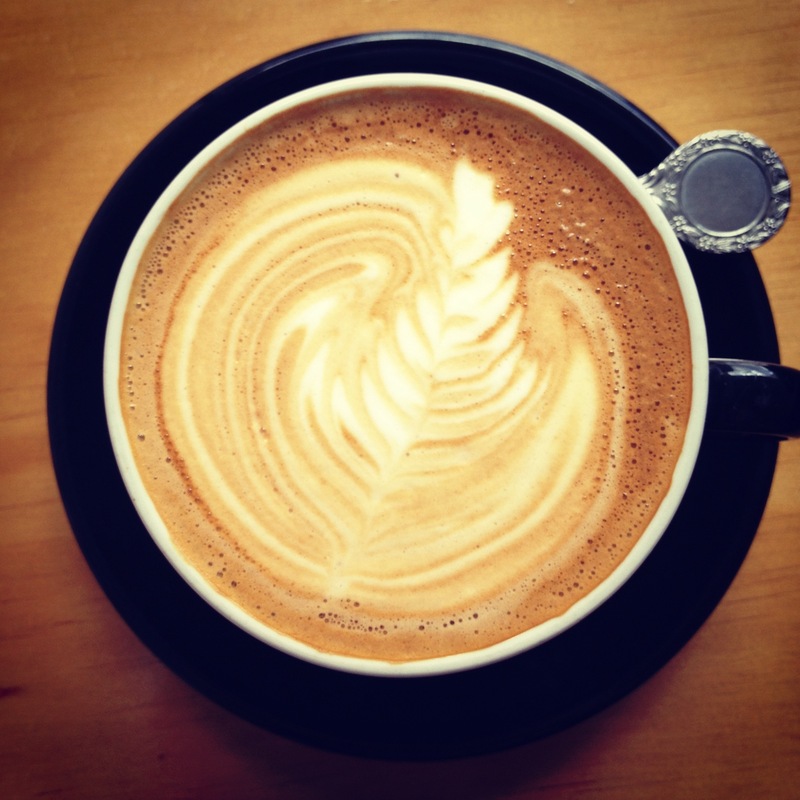 While some of the serious barista blogs that I read are starting to question the “specialty coffee” label, it’s another beanstalker.com rule of thumb that if a cafe describes itself in these terms then it should be given a fair hearing. 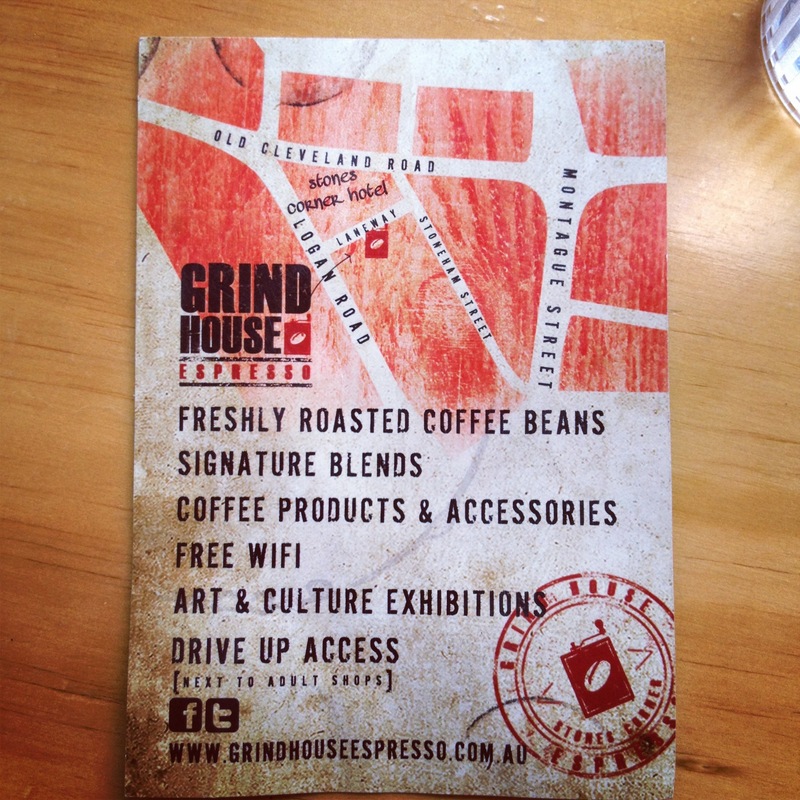 Grindhouse has been open for almost a year. It will celebrate its first birthday at the start of March. And boy, are they an impressive toddler. In that time they’ve made a pretty big change, based on an admirable philosophy – changing their name from Grindhouse Espresso, to the more particular, and admittedly loftier, Grindhouse Specialty Coffee. The name change sets a high bar. And the verdict, in a nutshell, is that these guys clear it, like a world champion pole vaulter in the very early heats, with heaps of room to spare. 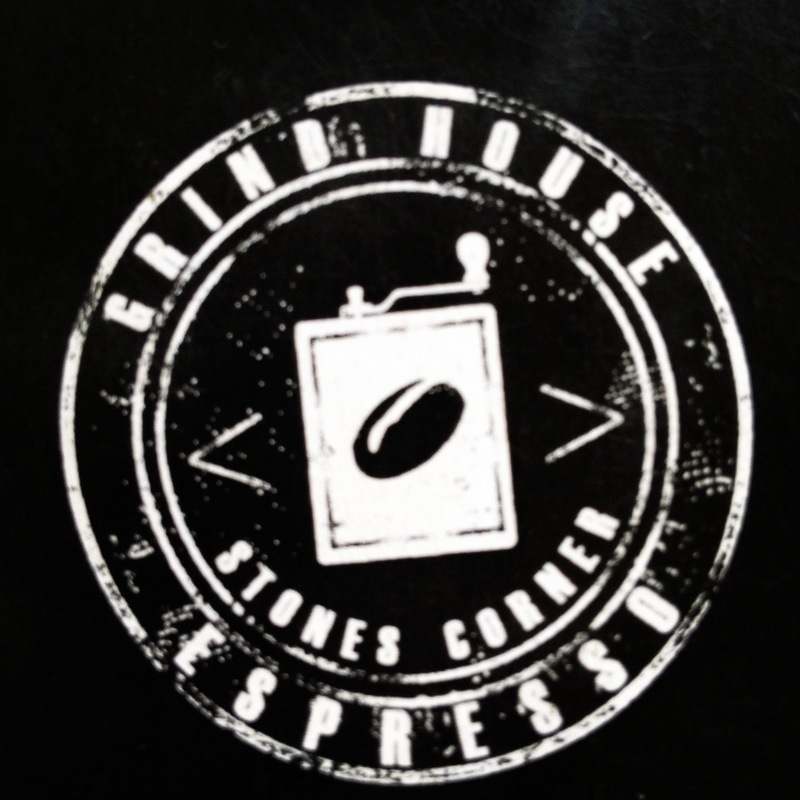 They offer a house blend, and two single origins – including, when we were in the Grindhouse, a Cup of Excellence El Salvadorian – which was excellent in the cup. And an amazing Bolivian. Bolivia is quickly shooting up the ranks as one of my favourite origins. They seem to offer a depth and complexity not present in the run of the mill South American and African stuff, which tend, in this author’s humble opinion, to generally offer one defining and distinguishing taste (so blueberry for Ethiopian Harrar, and caramely sweetness for most delicious Brazilians). Anyway, this is a digression – but not a harmful one. 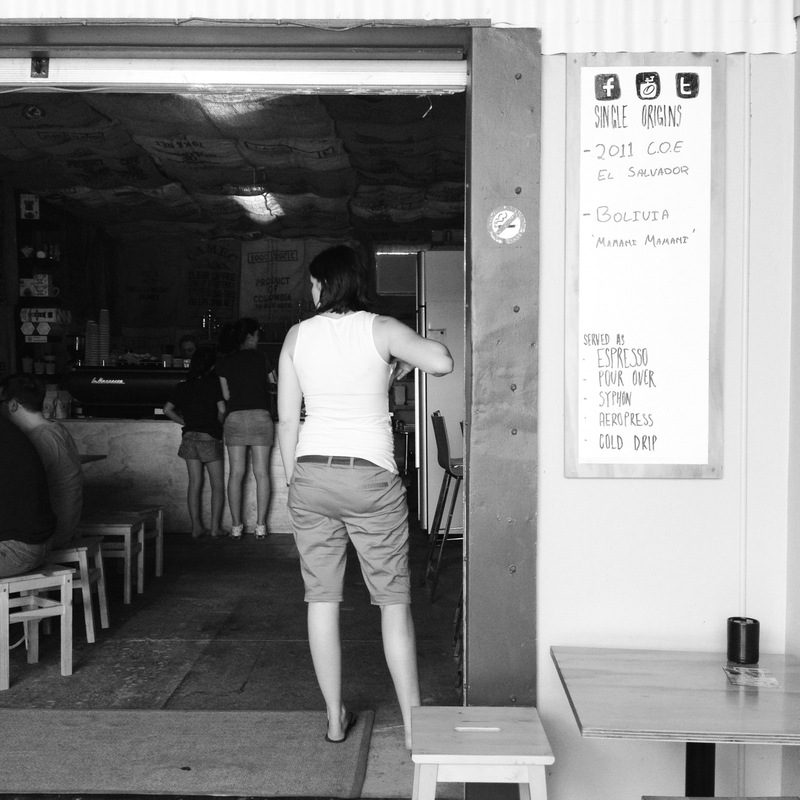 Grindhouse is an alley cafe, tucked in the carpark of an alleyway off Logan Road in Stones Corner. It’s a small space. Lined with abandoned coffee bags. Featuring revolving art works in a gallery space. 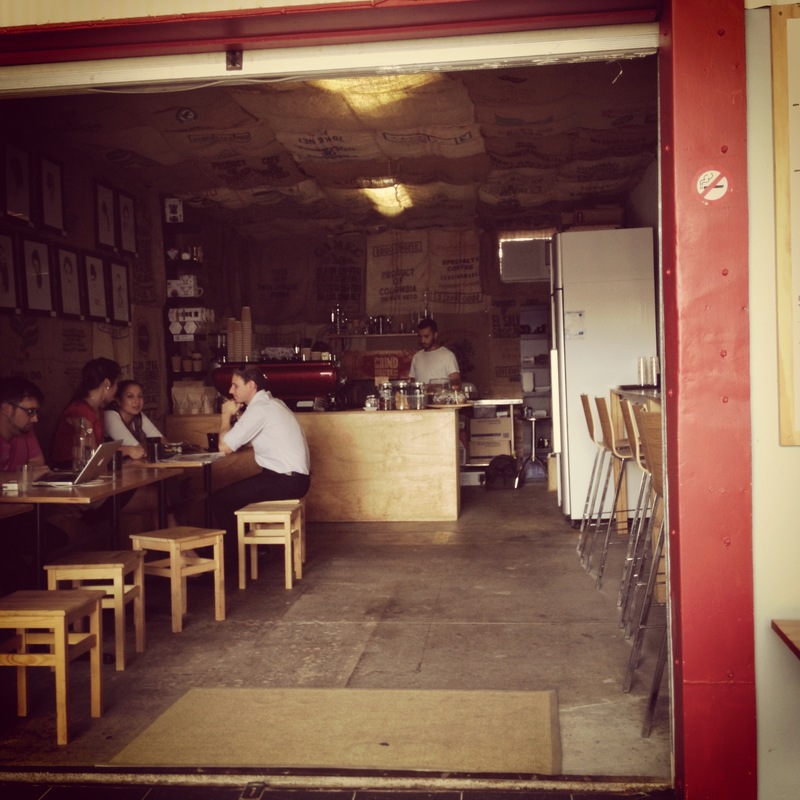 And serving up this sensational array of coffees via a beaut La Marzocco, and a range of brew bar options. My Flat White, first up, was on the Bolivian. And wow. It was bitter up front, but within seconds had moved into my mouth like a bunch of indie types at an occupy protest. So balanced, and with a really sweet aftertaste. It had this fruity thing going on that was either winey, or sultanaey. Which the the online tasting notes say may have been “plum” – but these things are made up anyway. It was temperatured and textured to my satisfaction. And served quickly. Full marks for that stuff. We took some friends with us for the ride. These guys aren’t huge coffee drinkers, but told me they enjoyed their coffees – and I have no reason to doubt that. 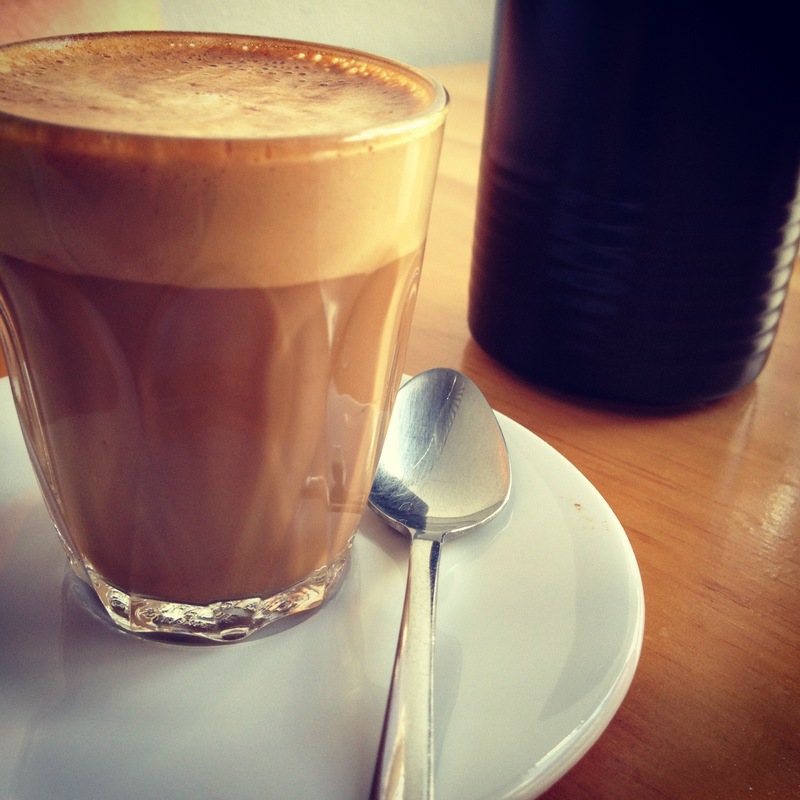 My wife’s standard order Piccolo, and my second flat white, were on the El Salvadorian, and they were pretty tops. I’d recommend this place to anybody who’ll listen. I’m a little spoilt for choice with Igloo up the hill, and these guys down it… but it’s nice to know good coffee is within reach.